Whilst I’ve been digging through a few old files relating to Music Is Better I came across some comments that had been left on a handful of the dance music forums in the days that followed. I’d forgotten all about these, so it brought a smile to my face to rediscover this little time capsule and remember just how good it made me feel that these people, after only one gig, already had so much faith in me. It wasn’t as though the place was packed, there were probably only about 90 people there, but as I’ve said before – they were the right 90 people. These words (and in some subsequent cases, the actions of those who shared them) were vital to the successful navigation of those crucial early stages of my comeback. A turn out of just 90 people could easily have been deemed an anti-climax, especially when the promoters had billed my appearance, with some fanfare, as ‘The Legend Returns’, but there was no negativity whatsoever – it was good vibes all round. They say the best recommendation is word of mouth, and this is certainly a case in point. Furthermore, the fact that it wasn’t just people from Manchester who were welcoming me back with such open-armed positivity, but from Sheffield, Birmingham, Leeds, Newcastle and London (and perhaps a few other places), helping spread my name further afield and resulting in bookings in all of those cities during 2014. Looking forward to seeing both old friends and new in Manchester on Friday. Also currently looking into the possibility of a 10th Anniversary tour in 2014. I’ll keep you posted. 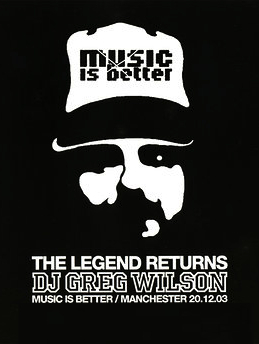 I’m sure you probably don’t remember Greg, but I headed down to the Attic that night with a friend after we chatted via email about your interview with Norman Cook that appears here http://www.electrofunkroots.co.uk/interviews/norman_cook.html The interview pretty much crystallised my introduction to electronic music and it still stands as one of the most enjoyable pieces of journalism I’ve ever read. As you say there wasn’t a huge crowd, but the music that night just soared. The Attic was dark with tatty leather couches that had seen better days. But I think for those listening, that set was like a breath of fresh air – for me it provided context for the music I was listening to back then. It was the right music at the right time. We had a brief chat before the gig and afterwards talked on email about the possibility of you one day playing Electric Chair. You generously sent me a copy of the cd from the night and a set of cds containing some of the best mixes from your Piccadilly years – In 2003 that was how we shared music and I think your generosity has grown exponentially with your presence online – introducing you to the huge audience you quite deservedly have today. So Thank you for that Greg and to the other guys that played The Attic in 2003. Music was truly Better after that night. .. the attics’ seedy charm. andy doing spins, danny with the biggest beam,.and proper tunes from a class DJ..what a night! MiB has a special place in my heart 🙂 thanks lovely people.